Enjoy Caramel Apple Pie Sangria as a surprising treat. 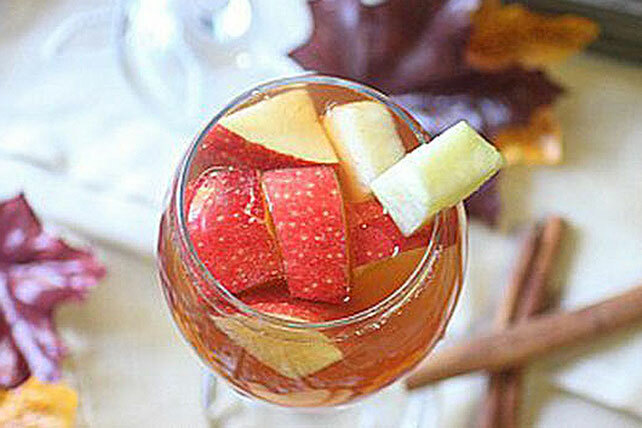 Caramel Apple Pie Sangria takes a classic and twists it with cinnamon, nutmeg and ginger spices. In a large sealable jar or container, pour apple cider, drink mix, and dulce de leche. Seal the jar and shake vigorously until dulce de leche and drink mix is dissolved. Add apples, cinnamon sticks, ginger, cloves, nutmeg, wine, and spiced rum; stir to combine. Refrigerate at least 2 hours to allow flavors to meld. Remove cinnamon sticks before serving. Serve over ice in tall glasses and top with seltzer. Reduce cinnamon sticks to 1 for a less spicy sangria or omit altogether. Double or triple the recipe to serve larger crowds. This drink can be made at least 24 hours ahead of time. Add the cinnamon sticks about 2-3 hours before serving.